How are the categories for climbs decided? In cycle racing, there are five grades or categories for climbs - Category 4, 3, 2, 1 & Hors (Above Category or HC). How do they decide what is category 1 and what makes it so hard it is a HC? As has been mentioned, the actual categories are fairly subjective. Things such as the fame of a climb as well as how the organizers feel about giving out King of the Mountain points on a given stage will affect rankings. That said, there are some general rules of thumb if you want to get an idea of how your local climb rates up to a given ranked climb in the tour though. There are always exceptions to climb rankings, but this should give you a basic list to start with. 2006, the TdF included the Cauberg, a key climb of the Amstel Gold race. It covers about 1.5km with an average of about 5%, it was ranked Category 3. There are a couple hundred meters @ 11% on it and placed just before the finish, it shattered the peloton. 2010, stage 12 finished just after the Col de la Croix Neuve. This was ranked as a Category 2, despite being only 3.1km long. It averaged 10% though, so hardly easy. Many of the category 4 climbs in the early flat stages would be unranked on a hillier stage. They exist so there is excitement in the king of the mountains classification early. As noted above, part of the ranking of a climb depends on its placement within a stage: usually, the ending climb of a stage gets "bumped up" by a category. 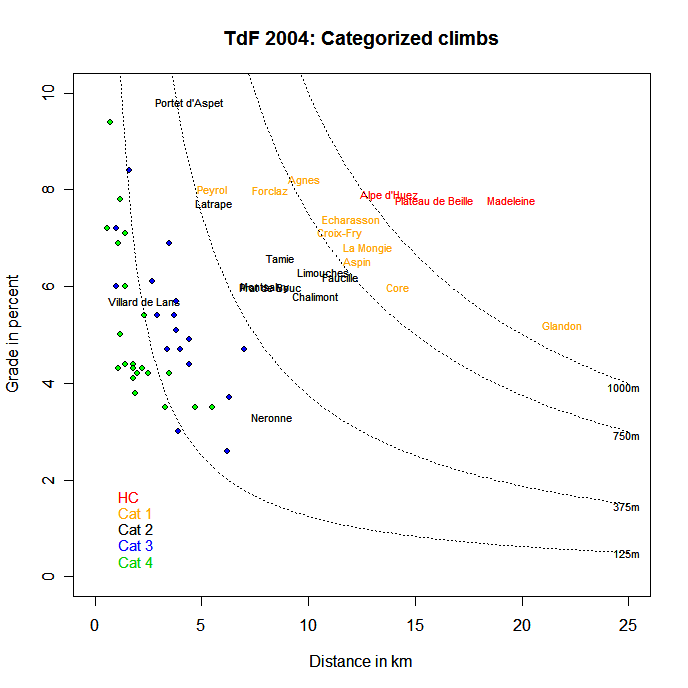 You can see that in the plots below, which show climbs as categorized by the organizers of the Tour de France itself for the 2012, 2007, 2005, and 2004 editions of the Tour, and plotted by the length of the climb and its average gradient. If given the length of the climb and gradient, you can calculate the total elevation change for that climb, and the dotted contour lines in each plot show that. Cat 2, 1, and HC climbs are named. For example, in 2004 the Vilard de Lans climb was classified at a Cat 2 climb rather than (evidently) a Cat 3 because it was the end of the stage. Similarly, in 2005 the climb to Pla d'Adet ended the stage, and it appears that its category was also increased from (arguably) Cat 1 to HC. As an aside, the Madeleine was climbed in both 2004 and 2005 but, as you can see, the length and gradient of the climbs were different in those years. In 2004, the Madeleine was climbed from the southern side; in 2005 and 2012, the approach to the Madeleine was from the north. For example Alpe d'Huez has a length of 13800m and average gradient of 8.1% (according to Wikipedia), giving a score of 111780, which would place it as a HC climb since its score is way above 80000. 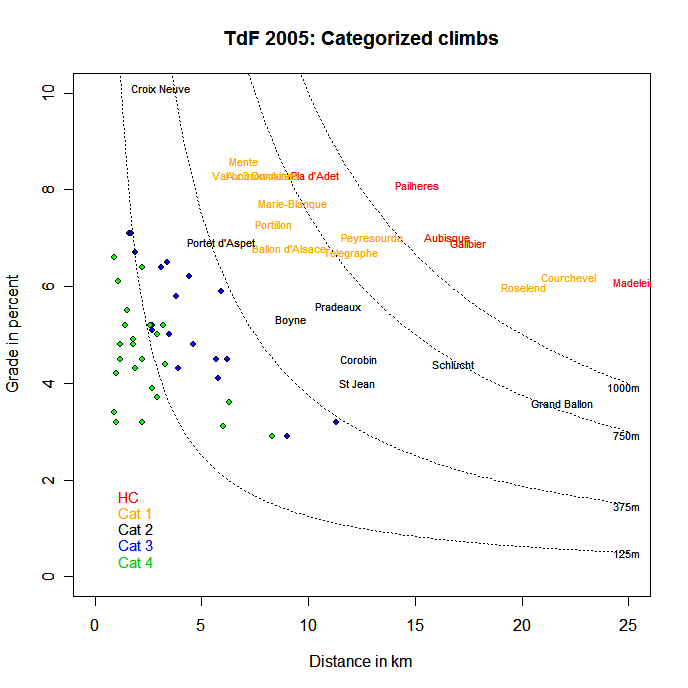 The tour organizers rank them subjectively based on their steepness, length, and also where they occur in the stage (climbs near the finish garner a higher ranking). Another criterion which seldom makes a big difference is road condition. Some people feel that the ratings have been inconsistent over the years, or have been inflated in recent years. 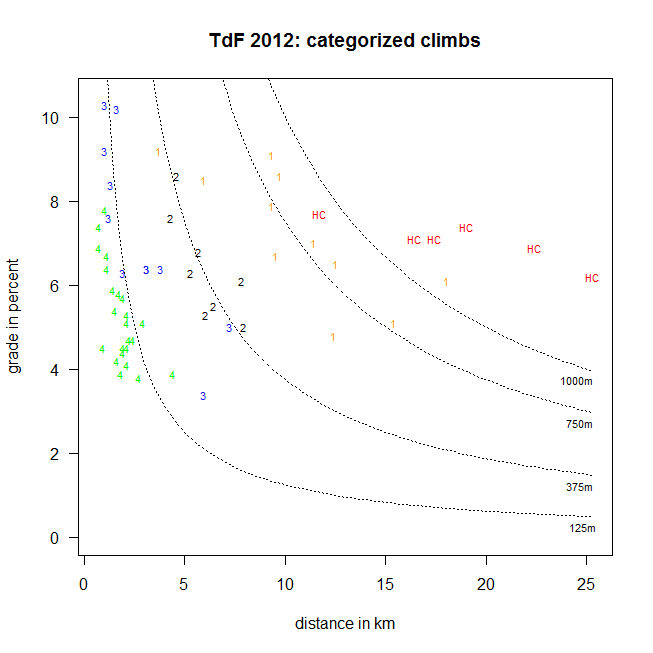 In short, there is no scientific way of rating the climbs, it's just a judgement call from the race organizers. Note, others have indeed tried to quantitatively rank the climbs. You could apply their methodology to climbs near where you live to figure out how a local climb might be ranked at the end of a tour stage. I prefer the cycling lore that it was decided by which gear of a Citroen 2CV you needed to be in to drive up the hill/mountain. For HC climbs you had to go up them in reverse. Scientific? Not so much. Perceived Gallic? Mais oui! Another important criteria is where the climb is placed. If you put an otherwise cat 1 climb at the end of a mountain stage with an uphill finish, it becomes an HC climb. Not the answer you're looking for? Browse other questions tagged racing climbing or ask your own question. 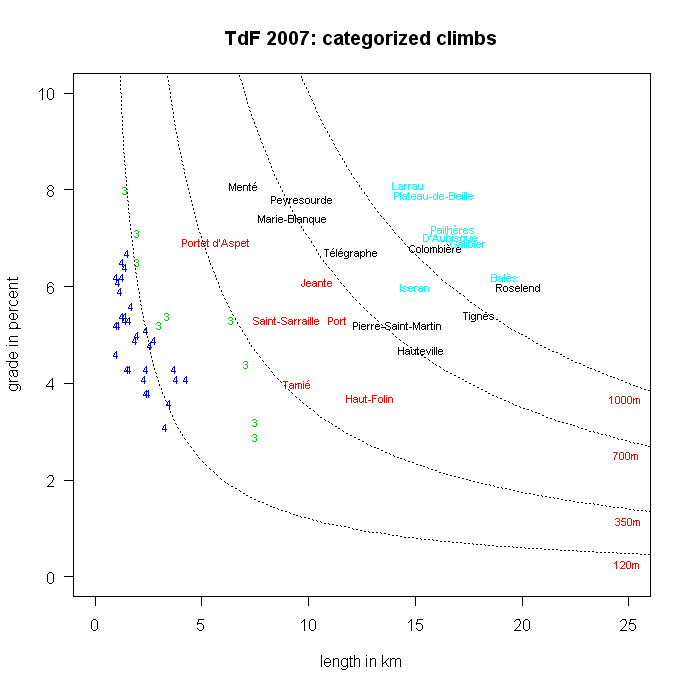 How hard is a category 2 climb? How are the racing categories in the US decided? BMX racing with a full size MTB? Hill climb Time Trial pacing strategy for short steep hills? what are good training program for offroad racing? Why don't women have Cat. 5?